If you are interested in participating in Part 5's readers and their Balenciagas - please send your photo my way to balenciagaloving@gmail.com. Have a great weekend! Crystal from cryskay.com sends us a gorgeous picture of her carrying a black Balenciaga City with Classic Hardware. Visit her blog for more amazing outfit photos. 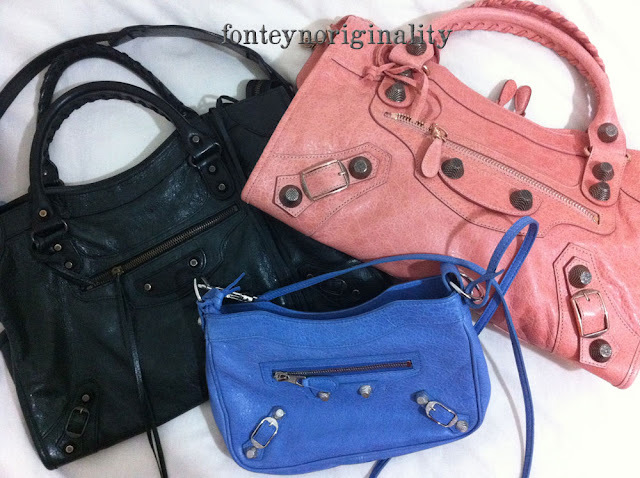 Fonteyn from Fonteyn Originality shares with a gorgeous picture of her Balenciaga collection! She has two of the newest colors: 2011 Vieux Rose RGGH City and Nuage GSH Hip! To balance out all the beautiful colors, she has a timeless black City too. Visit her blog for great beauty reviews. Lovely reader Yasmine shares with us another great photo - this time she carries her beautiful Papeete Town bag with Classic Hardware. Anna from the Haute Commodity shows us another great picture - this time she carries a stunning red Work bag. Giveaway 5 Sponsored by CSN Stores!